Johnny Was A Punk Rocker: Johnny Ramone, R.I.P. The following obituary for Johnny Ramone appeared September 17, 2004, on National Review Online. Last July, I was shoulder-to-shoulder with a bunch of sweaty rockers at the House of Blues on the Sunset Strip while they were complaining about needing a cigarette. We were all crammed in to see Alice Cooper and Ted Nugent blow the doors off the place. As everyone was grousing about the Los Angeles smoking ban, I could not help but chuckle to myself as I thought that if Johnny Ramone and Kid Rock joined them on stage, we would be at the one and only rock-n-roll Republican jam session. Of course, everyone knows about all the Democrat rockers. Bruce Springsteen even wrote an op-ed piece for the New York Times. How is that for rock-n-roll? All the hipsters have signed up to do fundraising concerts for John Kerry because, uh, well, he is not George W. Bush. It has been speculated that these concerts will raise upwards of $44 million dollars for the Kerry/Edwards campaign — becoming the rather absurd situation of rich musicians raising money for even richer politicians. Having rock stars snatching cash for liberal causes is not really news. Who is startled to hear that Sheryl Crow and the Dixie Chicks are joining Dave Matthews and Jon Bon Jovi in hawking tickets for the Democratic National Committee? The more intriguing stories, of course, revolve around independent rockers who do not tow the party line of Rolling Stone, notable house organ for the Democrats (except when P.J. O’Rourke lampooned the Commies). On Thursday it was announced that guitarist Johnny Ramone, one of the great independent-minded rockers, died in his sleep after battling prostate cancer for the last five years. He was 55 years old. 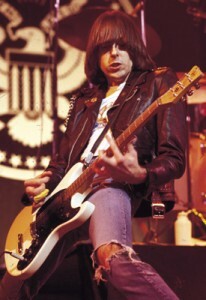 Born John Cummings, he was one of the founding members of the legendary American punk-rock band the Ramones (named after an alias that Paul McCartney used when checking into hotels). Johnny Ramone, was indeed, an unforgettable character. While the Ramones were being inducted into the Rock and Roll of Fame in 2002, Johnny took his opportunity at the microphone to make his allegiances known. “God bless President Bush,” he said, “and God bless America.” Bedecked in his trademark torn jeans and black leather motorcycle jacket, he understatedly thumbed his nose at he lockstep orthodoxy of the rock establishment. Now, that is punk rock. On his website, Ramone assembled Top-10 lists of his favorite baseball players (Greg Maddux), guitarists (Jimmy Page), singers (Elvis), Elvis films (Loving You), and horror films (Bride of Frankenstein). He even listed his favorite Republicans: Ronald Reagan, Richard Nixon, Charlton Heston, Vincent Gallo, Arnold Schwarzenegger, Sean Hannity, Ted Nugent, Rush Limbaugh, Bob Barr, and Tom DeLay. After hearing Slim Jim Phantom of the Stray Cats complaining about high taxes, Ramone told him the charges would be higher without the Bush tax cuts. “I told him he needs to vote Republican to keep his taxes lower — and donate to President Bush’s campaign,” he recalled. Ironically, Ramone had an eclectic collection of friends who included shock rocker Rob Zombie, provocative filmmaker Vincent Gallo, and Bush-basher Eddie Vedder of Pearl Jam. After Vedder impaled a mask of President Bush during a concert, Ramone tried to convince him of how alienating his political theater was for fans. Ramone died only days after a tribute concert was held in Los Angeles to celebrate the band’s 30th anniversary. The proceeds went to the Lymphoma Research foundation and the Cedars-Sinai Prostate Cancer Center. Singer Joey Ramone died three years ago from lymphoma, and Dee Dee Ramone died from a drug overdose in 2002. Emcee Rob Zombie called Johnny Ramone on a cellphone from the concert so that the fans could yell, “Hey ho, let’s go!” That was a fitting way for a rocker to leave the stage, knowing that his fans will never forget the music. Gabba gabba, hey, Johnny. R.I.P. — Steve Beard is the creator of Thunderstruck.Org and a contributing author to Spiritual Journeys: How Faith Has Influenced Twelve Music Icons. Photo by Steve Miller.